DULLES, Va.Aug. 12, 2015-- Orbital ATK, Inc. (NYSE:OA), a global leader in aerospace and defense technologies, is making excellent progress in resuming its cargo delivery service to the International Space Station (ISS) for NASA under the Commercial Resupply Services (CRS) contract, the company stated today. Orbital ATK is on track to launch its next CRS mission late this year and is moving forward with integration of a new first stage propulsion system into the Antares launch vehicle in preparation for multiple CRS missions in 2016. We committed to NASA that we would resume CRS cargo delivery missions as soon as possible under a comprehensive go-forward plan after the Antares launch failure last October, said David W. Thompson, President and Chief Executive Officer of Orbital ATK. Since that time our team has been sharply focused on fulfilling that commitment. With a Cygnus mission slated for later this year and at least three additional missions to the Space Station planned in 2016, we are on track to meet our CRS cargo requirements for NASA. Three main CRS program efforts are simultaneously underway, including preparing the enhanced Cygnus spacecraft for the next ISS cargo mission (OA-4) to launch aboard an Atlas V rocket this December; upgrading the Antares rocket by integrating and testing the new RD-181 main engines with the modified first stage core structure; and working with the Mid-Atlantic Regional Spaceport (MARS) to complete repairs to the Pad 0A launch complex at Wallops Island to support the resumption of CRS missions from Wallops Island in early 2016. Orbital ATK will launch its next Cygnus spacecraft to the ISS aboard an Atlas V rocket supplied by United Launch Alliance (ULA) from Cape Canaveral, Florida. The OA-4 CRS mission is scheduled for launch in early December 2015. Like most Orbital ATK spacecraft, Cygnus is designed to be compatible with multiple launch vehicles. This capability, combined with ULA s flexibility in making available a launch slot this year, is enabling Orbital ATK to carry out the mission on a shortened schedule to be responsive to NASA s ISS logistics requirements. For the OA-4 mission, launching aboard the more powerful Atlas V allows us to better support NASA s ISS cargo needs with a full load of about 3,500 kg of pressurized cargo, consisting of essential supplies, equipment and science experiments, said Frank Culbertson, President of Orbital ATK s Space Systems Group. The company also recently contracted with ULA for a second Atlas V rocket that will be used to launch an additional CRS mission in 2016 in order to provide NASA with the maximum cargo load Cygnus can carry. In 2016, we will carry out at least three more CRS missions: two (or possibly three) will be launched by Antares rockets, the first of which is on a path to be ready to launch early in the year, and one more will be launched aboard Atlas V to support NASA s need for additional cargo, Culbertson added. We have not finalized the exact sequence of these missions yet, but the plan capitalizes on the flexibility of Cygnus to launch on either vehicle and provides better schedule assurance for our customer. The Cygnus spacecraft to be used for upcoming CRS missions features an extended pressurized cargo module (PCM) that allows it to deliver larger volumes of cargo to the station than in previous missions. 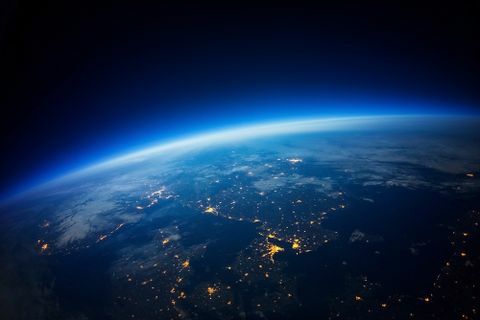 The spacecraft will also use the latest in lightweight space-qualified power system technology with the addition of the company s Ultraflex solar arrays. The PCM for the OA-4 mission arrived at Kennedy Space Center (KSC) earlier this week where it will be integrated with the Cygnus spacecraft s service module, which will arrive in early October. The service module, which houses the spacecraft s avionics, electrical, propulsion and communications systems, is currently completing final testing at the company s Dulles, Virginia satellite manufacturing facility. Final assembly, cargo loading and fueling of the Cygnus spacecraft will take place at KSC prior to its integration with the Atlas V rocket for an early December launch. Orbital ATK s Antares program remains on schedule to commence flight operations from NASA s Wallops Flight Facility in early 2016. 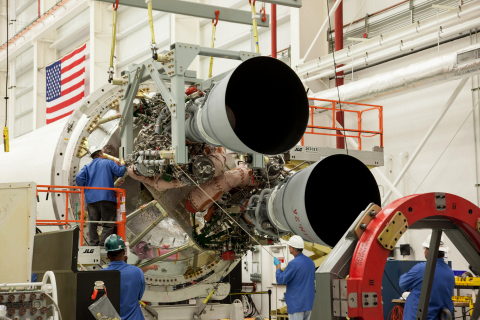 Following the completion of certification and acceptance testing of the RD-181, the first dual-engine ship-set arrived at the Antares integration facilities at Wallops Island in mid-July. The RD-181 engine provides extra thrust and higher specific impulse, significantly increasing the payload capacity of the Antares rocket. 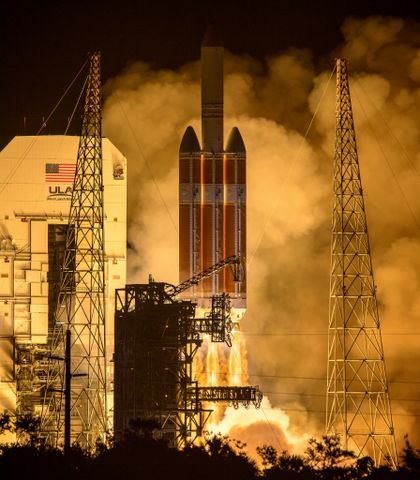 This state-of-the-art propulsion system is a direct adaptation of the RD-191 engine, which completed an extensive qualification and certification program in 2013, accumulating more than 37,000 seconds of total run time, said Mr. Scott Lehr, President of Orbital ATK s Flight Systems Group. Antares program engineers and technicians recently integrated the two RD-181 engines with a newly designed and built thrust frame adapter and modified first stage airframe. 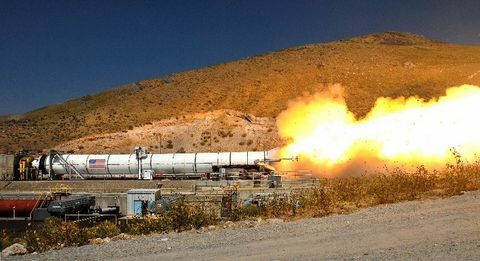 Later this month, new propellant feed lines and first stage avionics systems will be delivered to Wallops to support full vehicle integration. Orbital ATK plans to conduct a hot fire test on the launch pad late this year or in early 2016 to verify the vehicle s operational performance and compatibility of the MARS launch complex. With the delivery of the first set of flight engines now accomplished, and the second ship-set expected to arrive in the fall, Antares remains solidly on track to resume flights early in 2016. In fact, within the next couple of weeks all the hardware for the next Antares vehicle will be at our Wallops final assembly facility, with equipment for several additional rockets following a few months later, added Lehr. Repairs of the MARS Pad 0A launch facility at Wallops Island are currently underway and are scheduled to be completed at the end of September. Working with MARS, Orbital ATK has installed an upgraded hydraulic system used to erect Antares vertically on the pad, which recently completed testing and certification. Other launch pad systems are on track to comfortably support the on-pad Antares hot fire test late this year or in early 2016. Employees from Orbital ATK locations across the United States support the CRS program, including teams from Dulles, Virginia; Chandler, Arizona; Goleta and Commerce, California; Magna, Utah; and Wallops Island, Virginia. Our team and our partners are devoting maximum efforts to ensuring the success of NASA s ISS commercial cargo program, said Thompson. We are committed to meeting all CRS mission requirements, and we are prepared to continue to supply the Space Station for many years to come if we are selected for additional missions by NASA. Safe Harbor Statement Under the Private Securities Litigation Reform Act of 1995 Certain statements in this press release may be forward-looking statements as defined by the Private Securities Litigation Reform Act of 1995. Forward-looking statements often include the words forecast, expect, believe, will, intend, plan, and words of similar substance. Such forward-looking statements are subject to risks and uncertainties that could cause actual results or performance to differ, including the following: reductions or changes in U.S. Government or NASA spending, including impacts of sequestration under the Budget Control Act of 2011; the potential termination of U.S. Government contracts; the impact of the Antares launch failure; supply, availability, and costs of raw materials and components, including commodity price fluctuations; the timely completion of repairs at the MARS launch pad; and the performance of subcontractors and other third parties. Additional information concerning these and other factors can be found in Orbital ATK s filings with the Securities and Exchange Commission. Orbital ATK undertakes no obligation to update any forward-looking statements.